Hi folks! How are you? This way all normal, my life is getting better gradually. I am not with another permanent job yet, but for now I have achieved enough customers to self-makeup courses. I received also those temporary tattoos, but I intend to put together look to use them, you will become cool to show you. I'm just waiting for the climate of the city of Ubatuba get better, only here it has been raining, there is no fun! Well, let's see more about the products, and this cute makeup tutorial! 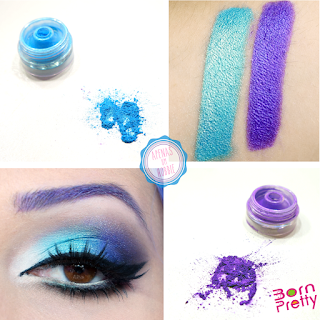 I received these three pigments in blue, purple and coppery. In the store the colors are # 02, # 03 and # 04 respectively. The brand of the pigments is Lomeou, I tried to find information about it on the internet but did not find, if you find in some site sends me in the comments please! The packaging is resistant both the container as the lid. The lids come with the edges of the pigment color, so there's no way to be confused with each other. The packaging is super cute, comes with these glitters gracing the caps. The description of the cover says it's a "glitter powder", but the product also adds color, beyond the sparkles, so fits more like pigments than just glitter. Another thing that is interesting in the package are these "second lids", which are actually dosing, so they do not fly every time you open the package, whew! The colors are amazing, the blue light has a brightness that goes to the turquoise (wait siren tutorial! ), Purple does not change much in its reflection, and copper has the glitter particles much larger than the previous ones. In the tutorial then used the blue and purple colors because the copper was unable to include in the context, but I'll do another using it, wait! Click on Play to See the Tutorial! And Then what did you think of the tutorial? It was cute right? Thanks for the whole body takes made by Ana Luiza Nogueira, my sister, thank you! The pigments you find this link here, with the price of $ 1.76, are 8 colors to choose from, and has discount!